Walton High is a centre of learning where values of excellence and scholarship blend with innovation in learning styles. Walton Learning Centre provides lifelong learning in an inspiring environment for 16-19 year-olds, both full and part-time students. 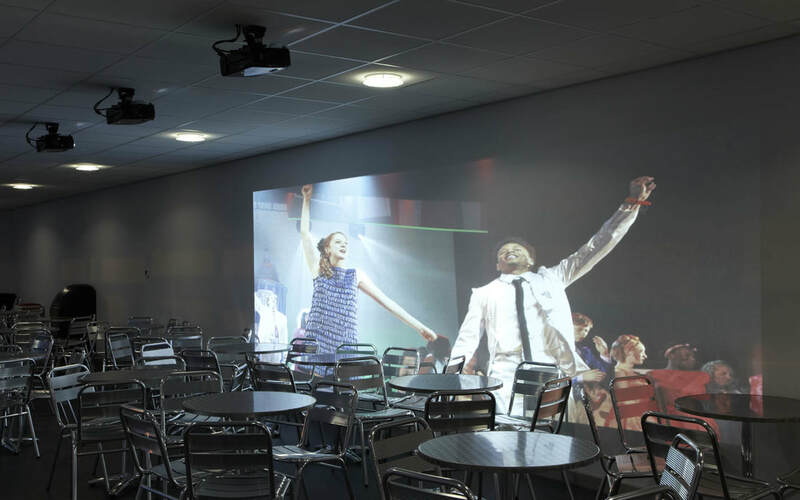 The school wished to commission an artwork that worked creatively with the interior of the Performing Arts Centre space to engage and delight visiting audiences. The two sites were within the long glazed window space or on the foyer wall facing the Post 16 centre. Two Works were made, a video wall and Light Lines. Made in collaboration with artist Ella Chapman, the Artwork comprises 17 light tubes that were inspired by figures in movement, through a series of dance and “making” workshops. “Light Lines” can be viewed as a resource by the school, as the intention is the lighting design can be changed, according to the performance or event that will be taking place within the venue.